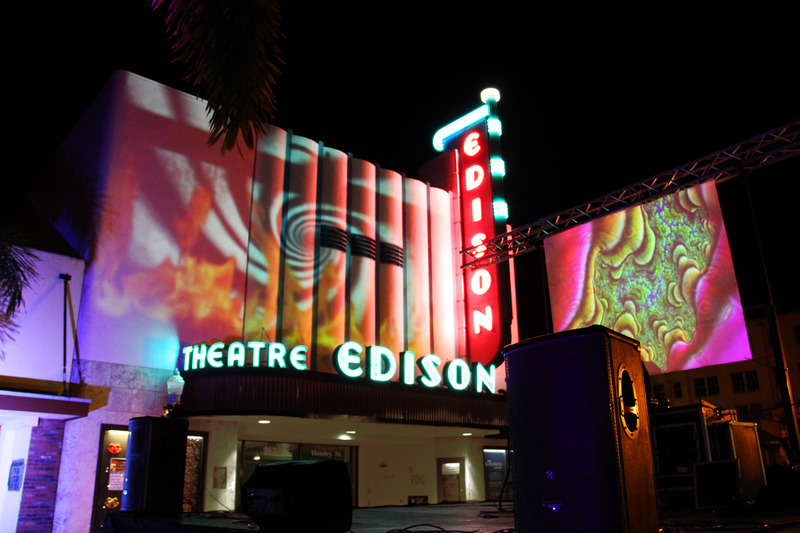 With a large inventory of projectors, SJP Productions is capable of large scale digital mapping projections. With current technology, we are able to make almost any surface into a mind bending visual experience. Treetops, water, mist, buildings, vehicles, tents – everything can be made a screen, but with mapping technology we are able to create surreal experiences unlike anything you’ve seen on traditional screens… but we have those, too! There are so many opportunities for digital media. Contact us today to discuss the possibilities in your venue! 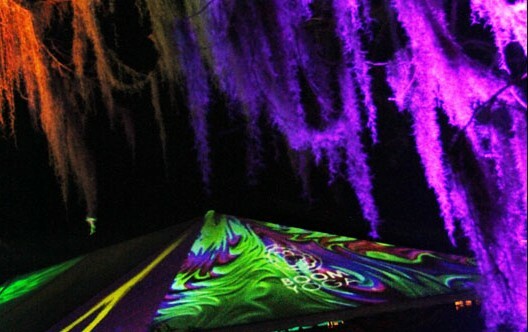 Tents are a HUGE canvas, and with custom content can be used to project any vibe. Projection mapped for a seamless scene, the immersive visual experience created by a large tent projection is enough to stop people dead in their tracks, and keep them riveted for hours. This can particularly enhance a VIP tent or silent disco experience. On the more practical side of things, the outsides of tents are the perfect spot to project signage or sponsor logos. For any tent experience: merch, sponsorship, VIP, whatever your needs — contact us to create the right package for your event! Sponsorship visibility can be the key to a successful and profitable event. But it’s hard to get anyone to look at a traditional sign these days. Projecting sponsor logos is a cost effective way of displaying many sponsor logos in unexpected and high visibility areas. Sponsorship visibility is also a great way to increase festival revenue. Your festival can provide sponsors or vendors with the opportunity to buy this valuable and eye catching ad space. We can play video commercials as well as stagnant logos; we can also apply effects to the logos or convert to high contrast with transparent background to overlay on trippy visuals, depending on what is appropriate or desired. Imagine walking through an event grounds at night and suddenly before you is a giant set of eyes looking at your from the trees! Treetop projections are a great way to add an element of surprise to your site that will really generate some buzz as people try to get a grip on what they are seeing. We go to great lengths to hide the equipment using special outdoor mounting hardware as well as waterproof casings in order to provide passers-by with a mind boggling and and unexpected experience. Most who witness the projections stop to snap pictures, and many spend a great deal of time scouring the surrounding area to find the source of the image because it defies what they are used to seeing with traditional video techniques. It is truly a new and unique effect that many people have not heard of or seen yet. Through our extensive experience we have discovered the correct graphic elements that work with the irregular surface and shapes of the treetops, and have created custom graphics specifically for this setting. We are also able to work with your branding and logo to create a custom treetop projection to promote your brand (*logos may need to be altered for treetop visibility). Lots of these effects can be really hard to describe and even harder to imagine, so check out this short promo video from Gathering of the Vibes 2013 to get an idea. For even more examples, check out our event galleries!